M-11 type firearms can be found on just about any online gun auction site or at any gun show. But before you buy one with you’re hard earn cash you might want to follow the simple check list below. 1. Is the gun what the seller says it is? For example if it is being sold as pistol but the receiver says CM-11 (the carbine version of the PM-11). Or the seller is claiming the gun is a pre-ban (not that it matters anymore regardless) and it’s marked as a PM-11. 2. Are the accessories installed on the gun legal? This primary applies to semi-auto versions of the M-11. For example a PM-11 with a folding stock is illegal unless registered as a SBR. 3. Does the lower receiver look normal or is it malformed? This primary applies to transferable full-auto M-11 variants. Sometimes a full-auto M-11 can be found that has receiver damage from a catastrophic ammo failure or a poor factory weld. Some sellers will fail to mention this to make a quick buck & will pass these off onto unaware buyers. This usually happens with guns bought online so be sure of what you are buying. It’s a good idea with these guns to remove the upper and look at the welds in the lower to make sure they are not cracked or broken. 4. Do the moving parts function correctly? Check to make sure when you pull back the bolt it doesn’t bind up and get stuck. 5. Do all the parts look to be there? 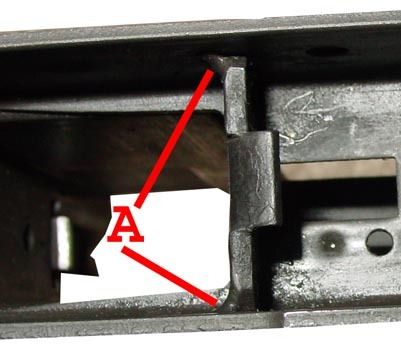 Do a quick check from the outside to make sure items such as safety switches, axis pins, etc are there. 6. Do any of the FCG parts appear to have excessive wear? This primary applies to transferable full-auto M-11 variants. On some FA models the sear and sear catch may have worn prematurely which can result in a runaway or malfunctioning gun. Look in the trouble shooting section for more information on this problem. 7. Does the gun appear to match the “history” that the seller is giving? For example if the seller claims the gun is NIB (New In Box) and has never been fired yet there is powder residue inside the chamber or carbon build up you know they are not being completely honest. NOTE: DO expect that if the gun has been a safe-queen, it will need to be disassembled and lubricated, and the rubber or neoprene buffer at the back of the bolt will probably have hardened or disintegrated and need to be replaced -- that's to be expected, and it doesn't make it a bad gun to purchase. Just remember be vigilant, by doing your homework beforehand, you are less likely to get ripped off or pay far too much for what you're getting.